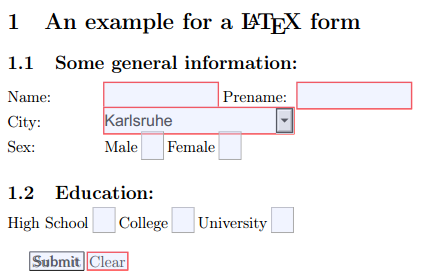 I've just stumbled across a full, working example how to create a html form within an LaTeX document. You can fill this form within your PDF-Reader. Here is the example PDF-file. It seems as if the \ChoiceMenu radio option is buggy at the moment. Does anybody know how to fix that? edit: Hmm ... it works in Chromes PDF reader, but not in Document Viewer. Mayby Document Viewer is buggy.